The new iGadgets were unveiled during a press event Wednesday at San Francisco’s Bill Graham Civic Auditorium. “While they may look familiar, we have changed everything about these new iPhones,” said Tim Cook. Apple has updated its two smartphones. 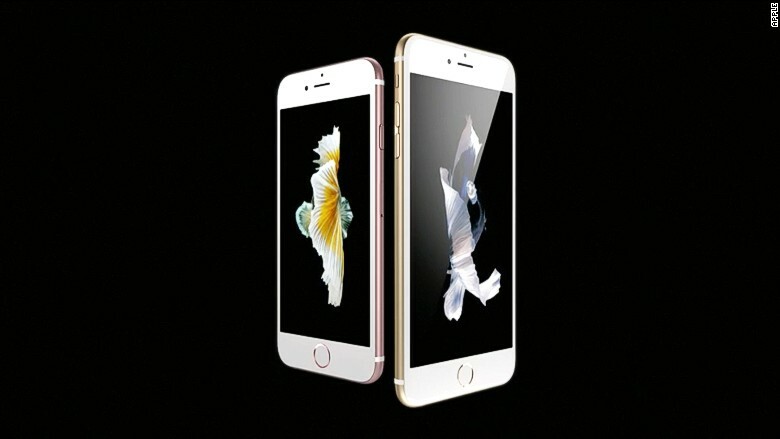 The new iPhone 6S and iPhone 6S Plus are available in four colors: silver, gold, space gray and rose gold. The devices are now made from 7000 series aluminum, which is an aircraft-grade material. It’s stronger than the previous phone aluminum and is unlikely to bend. The devices’ biggest addition is a 3D touch screen, a feature introduced on Apple trackpads and the Apple Watch, that was previously known as Force Touch. The technology recognizes new gestures like pressing and holding. It vibrates slightly to let you know it’s been pressed. The new iPhones also come with a 12 megapixel iSight rear camera, with 50% more pixels than the iPhone 6. The front-facing camera is now 5 megapixels (for sharper selfies). A kooky new photography feature called “Live Photos” combines photos and videos. When you take a photo with the Live Photo setting on, it records a second-and-a-half video before and after the clip to make a tiny little video. Press and hold on your photo and it will play. The phones also have the new A9 processor and faster fingerprint sensors. There are new charging docks to match the colors of the iPhones as well as new covers. The phones will cost the same as the last version (starting at $650 and $750 for the 6S Plus). The previous versions (iPhone 6 and 6 Plus) will each drop $100. A new iPhone Upgrade program lets you lease an iPhone for $32 a month and get a new version every year. The new iPhones will go on pre-sale on September 12 and will hit stores on September 25. IOS 9 will be available on September 16 for anyone with an iPhone as old as an iPhone 4S. As expected, Apple is making a bigger, faster iPad. The iPad Pro is 12.9 inches. It’s the same height as the iPad Air, so you can run iPad Air apps side by side. The screen has 5.6 million pixels — more than a 15-inch MacBook Pro with a Retina display. The iPad Pro starts at $799. Inside it’s much faster. The iPad Pro has a new A9X 64-bit chip. It’s 1.8 times faster than the previous iPad’s CPU (“desktop class” according to Apple executive Phil Schiller). It is powerful enough to edit three streams of 4K video at a time. It has a 10-hour battery life, is super thin and weighs just over 1.5 pounds. “Why make an iPad with a bigger display?” asked Schiller. Good question! Games and movies look better on a bigger screen, he said. It’s big enough to have a full-size keyboard on the screen. If you don’t want to type on the screen, Apple has made a new smart keyboard that doubles as a cover, Microsoft (MSFT, Tech30) Surface-style. The keyboard is coated with a thin fabric. The company is also making its own stylus, but with the usual over-the-top design and marketing. Yes, it’s the Apple Pencil, a low latency stylus that feels like a real pencil. It even got its own Jony Ive narrated videos. It “feels like a true writing or drawing instrument,” said Ive. 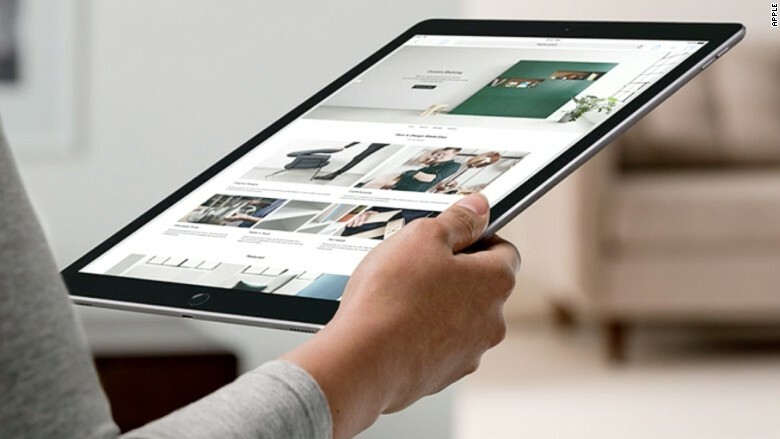 As the name implies, the iPad Pro’s real target audience is business users. To show that it’s serious, Apple brought out a very unexpected partner to demo the iPad Pro: Microsoft’s Kirk Konenigsbauer. He demonstrated Microsoft Office for iPad Pro using the Apple Pencil. For the final demo, Irene Walsh from 3D4Medical showed off her startup’s 3D medical app that shows 3D interactive anatomy images for medical students and patients. The company also announced a new iPad Mini 4. “We believe the future of television is apps,” said Tim Cook before introducing the expected new Apple TV. The latest Apple TV features a third-party App Store, a new remote, Siri controls and a completely overhauled operating system. The TV now runs on tvOS, which is based on iOS and “built for the living room,” according to Apple’s Eddie Cue. The device will start shipping in October and cost $149 for the 32 GB version and $199 for 64 GB. The new black remote features a glass touch surface on the top half, so you can navigate the Apple TV with swipes and other gestures. The Bluetooth remote has volume controls for the TV and a built-in accelerometer and gyroscope. It can last three months on one charge. It recharges using a Lightning connector. Too lazy to swipe? Tell Siri what you want, like, “Siri, show me a New Girl episode with Jamie Lee Curtis in it.” If you miss something, say, “Siri, what did she say?” and the episode will rewind a few seconds and turn on captions. Don’t know what you want to watch, Siri can make movie and TV suggestions based on things like genre. Siri searches across all apps, so you don’t have to jump between HBO Go and Netflix to find something specific. The biggest boost for the device is opening it up to third-party developers. You can use the device to play multiplayer games. Apple demoed a few examples, including Harmonix’s Beat Sports and Hipster Whale’s Crossy Road. Another app by Gilt lets you shop directly from the Apple TV. MLB has an Apple TV app for watching multiple live games at a time with pop-up notifications and interactive stats. The company kicked off the event with an update about the Apple Watch. Fashionistas now have more band options. The biggest addition is a wrap-around brown leather Hermés band, which will be available in October. The watch itself now comes in gold and rose gold, and there are new sports band options as well. The smart device was released in April. There are now more than 10,000 watch apps, including a few new important additions. Facebook Messenger’s app will let you send text, audio and location messages. GoPro’s app acts as a viewfinder for your camera. iTranslate lets you speak a word and get a translation and AirStrip is a tool for medical professionals. It’s also adding transit directions to the included Maps app.